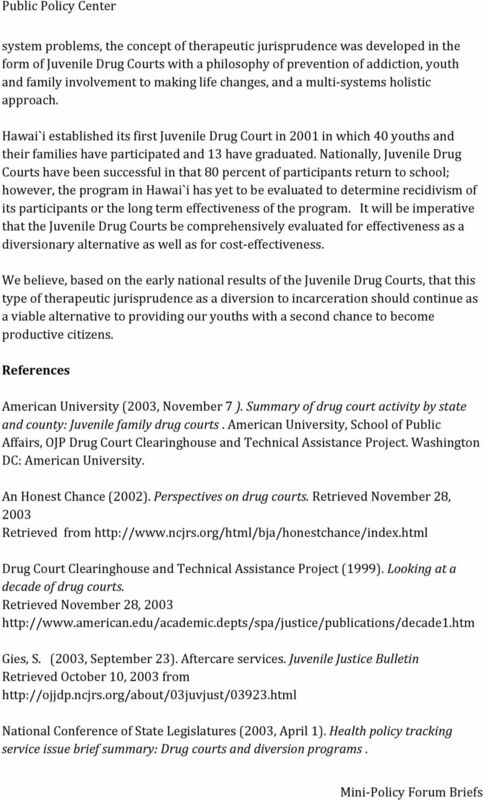 Download "Drug Court as Diversion for Youthful Offenders"
6 system problems, the concept of therapeutic jurisprudence was developed in the form of Juvenile Drug Courts with a philosophy of prevention of addiction, youth and family involvement to making life changes, and a multi- systems holistic approach. 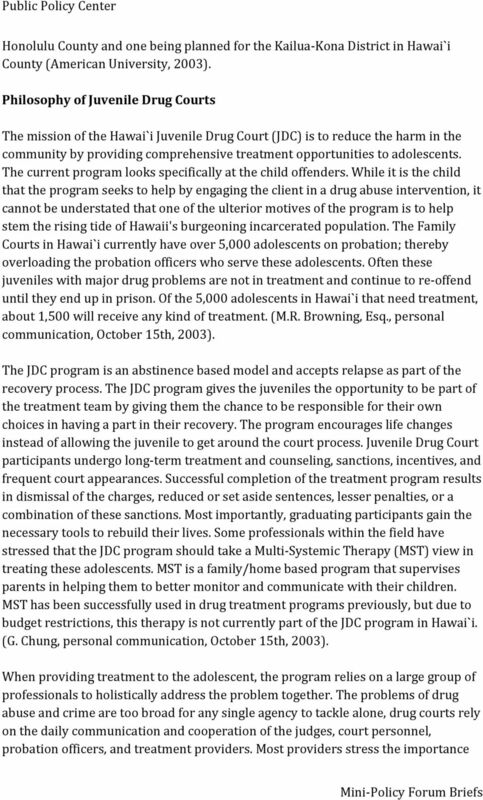 Hawai`i established its first Juvenile Drug Court in 2001 in which 40 youths and their families have participated and 13 have graduated. 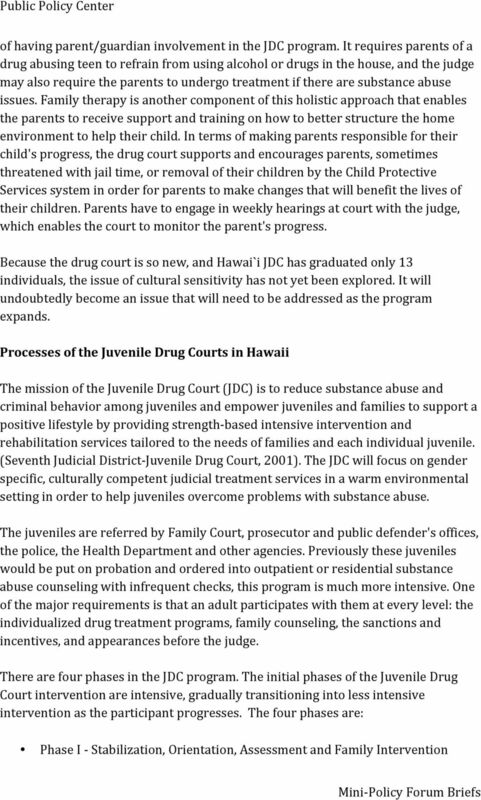 Nationally, Juvenile Drug Courts have been successful in that 80 percent of participants return to school; however, the program in Hawai`i has yet to be evaluated to determine recidivism of its participants or the long term effectiveness of the program. 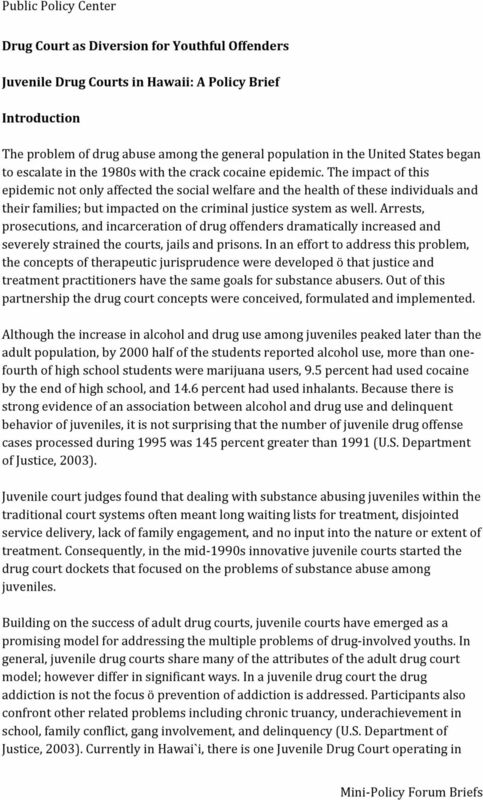 It will be imperative that the Juvenile Drug Courts be comprehensively evaluated for effectiveness as a diversionary alternative as well as for cost- effectiveness. We believe, based on the early national results of the Juvenile Drug Courts, that this type of therapeutic jurisprudence as a diversion to incarceration should continue as a viable alternative to providing our youths with a second chance to become productive citizens. References American University (2003, November 7 ). 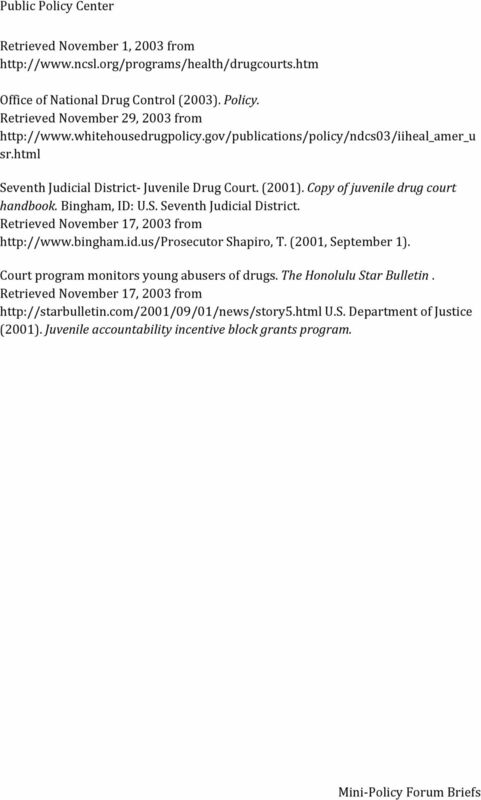 Summary of drug court activity by state and county: Juvenile family drug courts. American University, School of Public Affairs, OJP Drug Court Clearinghouse and Technical Assistance Project. Washington DC: American University. An Honest Chance (2002). Perspectives on drug courts. Retrieved November 28, 2003 Retrieved from Drug Court Clearinghouse and Technical Assistance Project (1999). Looking at a decade of drug courts. Retrieved November 28, Gies, S. (2003, September 23). Aftercare services. 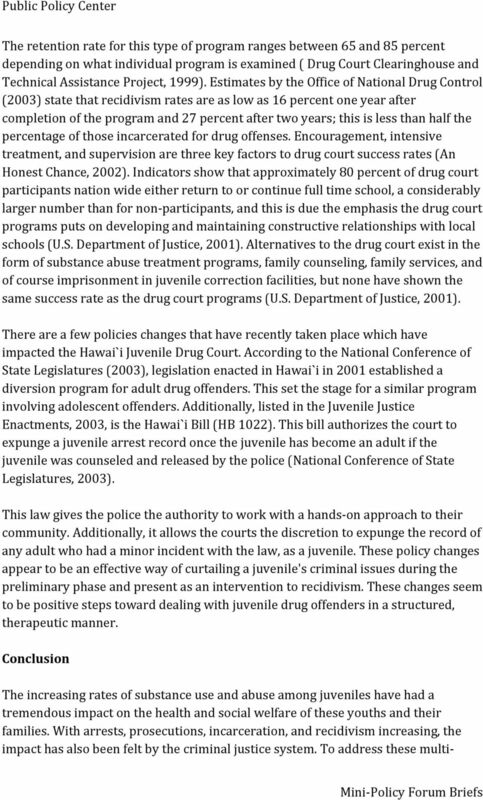 Juvenile Justice Bulletin Retrieved October 10, 2003 from National Conference of State Legislatures (2003, April 1). Health policy tracking service issue brief summary: Drug courts and diversion programs. 7 Retrieved November 1, 2003 from Office of National Drug Control (2003). Policy. Retrieved November 29, 2003 from sr.html Seventh Judicial District- Juvenile Drug Court. (2001). 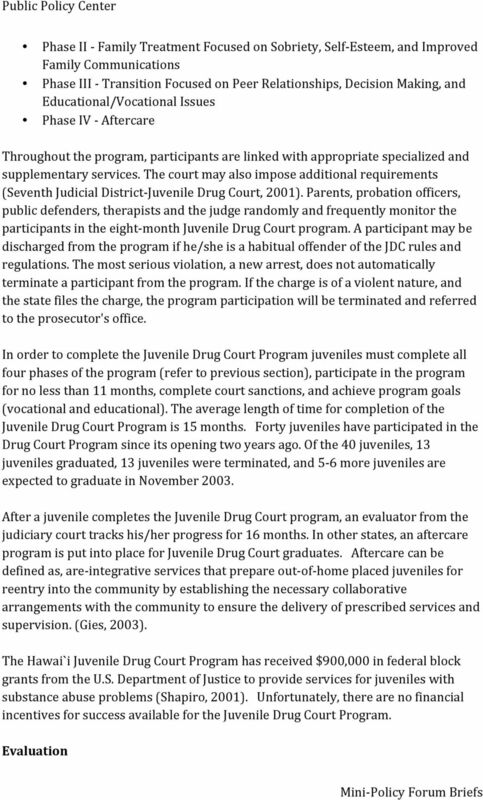 Copy of juvenile drug court handbook. Bingham, ID: U.S. Seventh Judicial District. Retrieved November 17, 2003 from Shapiro, T. (2001, September 1). Court program monitors young abusers of drugs. The Honolulu Star Bulletin. Retrieved November 17, 2003 from U.S. Department of Justice (2001). Juvenile accountability incentive block grants program. WHAT MAKES A PERSON ELIGIBLE FOR THE DRUG COURT PROGRAM? WHAT HAPPENS NOW THAT I HAVE BEEN ACCEPTED INTO DRUG COURT? SEBASTIAN COUNTY DRUG COURT Client Handbook Page 1 Revised 6-26-2013 INTRODUCTION TO DRUG COURT You have been arrested for a felony crime and have been identified as a person who may have a drug problem.